Normally, Robin Hood robs from the rich and gives to the poor, but this year he and his band of merry men (or boys, in this case) will gladly settle for candy in lieu of the usual pilfered riches. And honestly, they'll probably just eat it all themselves. So this Halloween, let your little swashbuckling do-gooder go knocking on the doors of Nottingham in this awesome and richly detailed Robin Hood Costume! Made of faux suede and a forest-green crushed velvet, the centerpiece of the outfit -- the tunic -- has that authentic, historical look that would work just as well at a renaissance fair as it would in the hideaways of Sherwood Forest. The matching hood also has the classic cowl collar, and can be worn up or down, whichever way Robin Hood prefers it. The shoe covers come up to the knee (for an awesome and realistic knee-high "boot" look) and the belt ties it all together (but not literally, since the tunic stays in place with easy-to-use velcro). Finally, the costume also includes a gauntlet that looks like those used by archers (to protect their forearms)... and those guys who can make falcons land on their arms. We're not sure if Robin Hood ever did that, but we're pretty sure we could if he felt like it. In this authentic and fun Robin Hood Costume, your kid will give the Sheriff of Nottingham (or just the neighborhood watch) a run for his money. 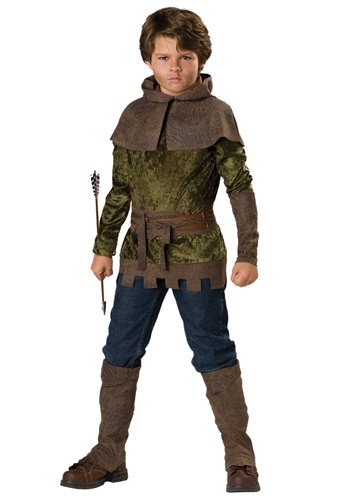 And if you're envious that he gets to be Robin Hood this Halloween, don't fret -- it comes in adult size, too! Worst experience of all Halloweens!!! Am stuck with this costume and I needed this costume for my son's school, I exchange my first costume because it was too big and the second costume I got it looks like it was made out of cardboard.